"Giant Bear and I got engaged at Christmas and were married in April. 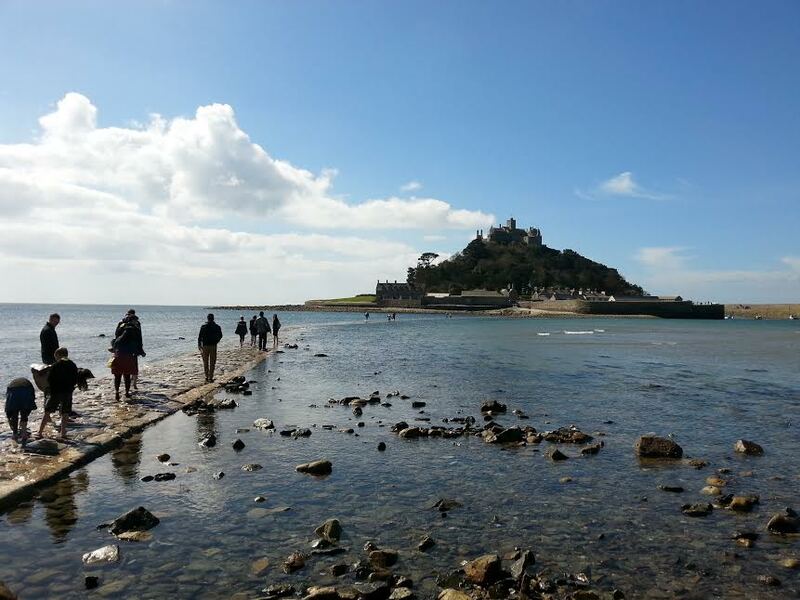 We organised a two-day wedding, hen party, stag do and honeymoon in less than four months, for just under £6k (£3k if you take off all the money we managed to raise or were given!). And it was so much fun! Here’s how we did it: i. prioritising; ii. making stuff; iii. letting people help. In this post, I’m going to talk about priorities. Decide what matters *to you* If you’re paying for your own wedding, decide what matters to you, and spend money and time on that. There are certain things you can’t and shouldn’t do in church (e.g. I know of a girl who had to walk down the aisle to ‘Mr. Boombastic’ when the best man pressed the wrong button on the sound system, and then had to endure being told off by the vicar afterwards), but otherwise, you do you. If you want the whole thing to be themed around the films of Sydney Poitier, or your bridesmaids to carry albino bunnies instead of flowers, good for you. We made a bunch of non-traditional decisions, the biggest of which was to spread the whole thing over two days. Day One was our civil ceremony (tiny, intimate), followed by the stag do (yes, the stag do was after the civil ceremony. Nobody cared). Day Two was our blessing in church (people, music, afternoon tea) and reception. 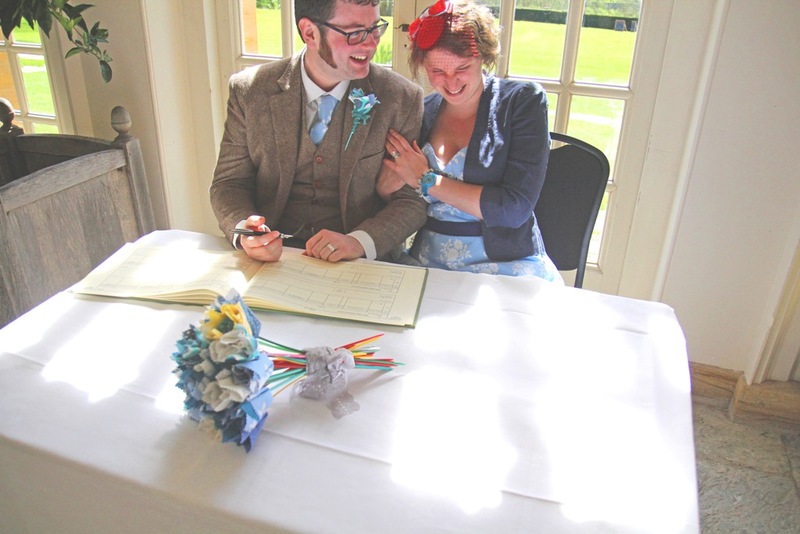 The extra day cost us £375 in venue hire, but it was the best decision we made. One friend wrote afterwards that it couldn’t have been anyone else’s wedding and that was the nicest thing anyone could have said about it. We didn’t have a theme: just lots of things we love. For example, we met singing in the choir, so we included lots of lovely music and went to the two-hour rehearsal on the day (we took a packed lunch and I did my hair and makeup in about ten minutes, using a borrowed mirror!). Choir: important. Hair and makeup: not so much. We also love cake and cheese. We’d seen the fashionable towers o’ cheese, but didn’t want to miss out on cake (cake-based hen party and afternoon tea-and-cake notwithstanding. MORE CAKE). 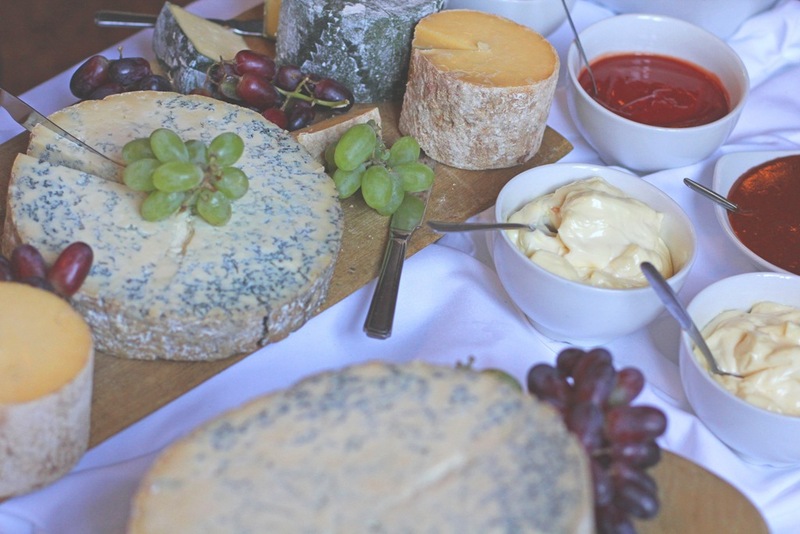 I called a local cheese shop and ordered £100-worth of local cheeses, and we took string and greaseproof paper to the reception so that our guests could take some home with them (we also took some on our honeymoon!). 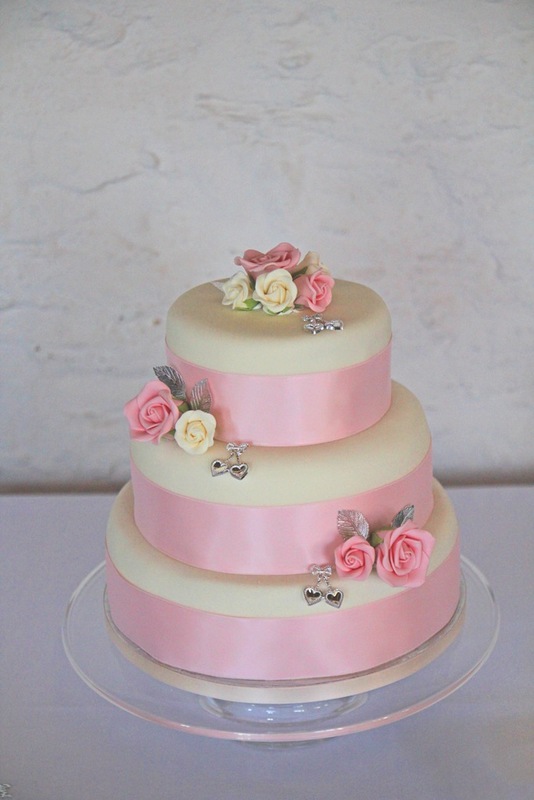 Our traditional three-tier wedding cake was made and decorated by Giant Bear’s mother (free, gorgeous, and gave her something useful to do). Each layer was a different flavour (carrot, ginger and lemon drizzle) and we served this with the cheeseboard as pudding (i.e. dessert for sixty people for less than £2 per head). Giant Bear also loves trains, so rather than traumatising the inhabitants of some unfortunate European capital with his drunken antics, his stag do was a trip on the West Somerset steam railway (£15 per head) and then dinner at our house. 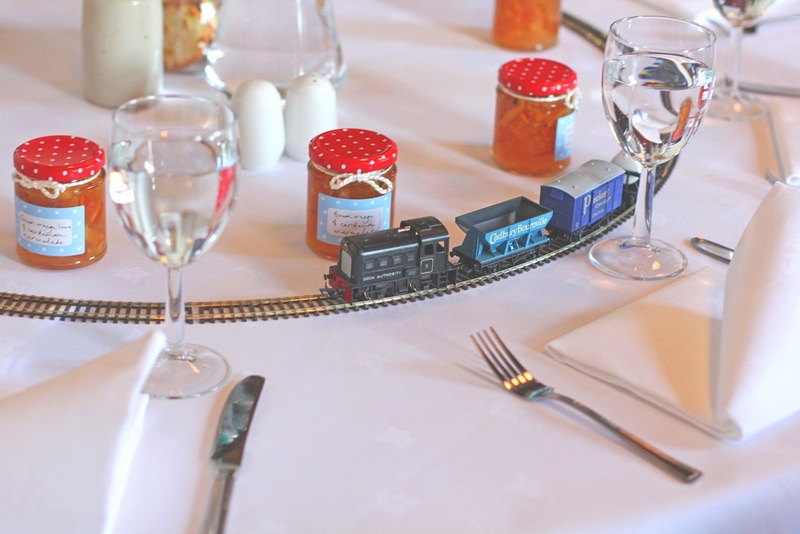 We also built circular tracks on the tables at the reception for tiny model trains (they went round and round – we covered the battery boxes with leftover invitations!). My point is this: your guests remember the quirky stuff. They won’t remember the £400 tiara the sales lady thinks you look great in and that you’ll never wear again. Can’t see the point of bridesmaids? Me neither. I didn’t have any and nobody cared. Don’t want the stress of organising a complicated holiday at the same time as your wedding? Good for you. We had three days in Cornwall (Lowendra £35 pp/ night) and then a week on a narrowboat (it belongs to Giant Bear’s parents, so free!). This required virtually no organisation, and we didn’t waste a single moment hanging about in an airport or worrying we hadn’t packed the passports. Also, that there is no rule that says you *must* take your honeymoon immediately after your wedding. If you want to put it off while you save up/lie down in a darkened room with a cool flannel over your face, fine. Getting a really good photographer who will capture the day (not just document the fact that yes, you were definitely in a room with those people) is well worth investing in, because you’ll be showing these pictures to people for decades! i. Wear clothes you can wear again. I’ll talk more about my (two!) wedding dresses in another post. They are both simple, knee-length silhouettes and I didn’t wear white, so I can wear them again whenever I like. *I* know I’m wearing my wedding dress, and Giant Bear knows, and it’s a lovely little secret to share, sitting in restaurant somewhere when nobody else knows. 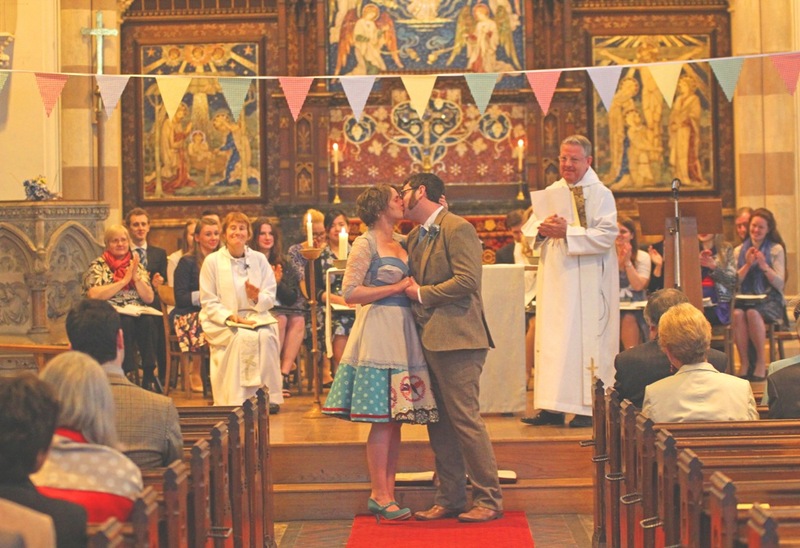 I wore my church dress to dinner on our honeymoon, and it was ace. 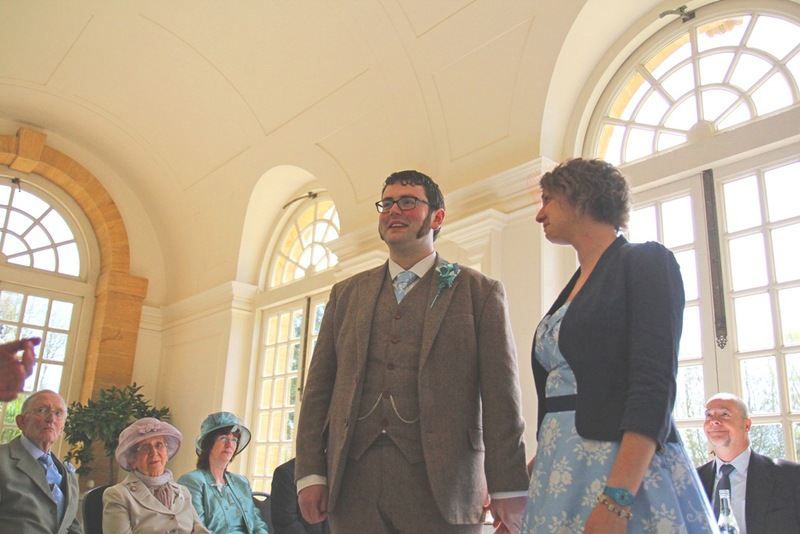 Similarly, Giant Bear wore a tweed three-piece suit for our wedding, which he loves and can wear again (sale at Victor Valentine £299). He wore shoes he already owned and my mother-in-law and I made ties for all the men (Giant Bear regularly wears his to work). In other words, it doesn’t matter how much you spend on an individual item of clothing, but how much wear you are going to get out of it. If you can wear things again, it’s worth spending money and time on them; if you can’t, make sure you can sell or donate them afterwards, rather than giving houseroom to (say) a morning suit and a top hat for the next forty years. ii. Make a wedding album of music from the day. Giant Bear made ours in advance and played it in the car on the way to our reception. It brings the day back so vividly, and it was simple and fun to do. 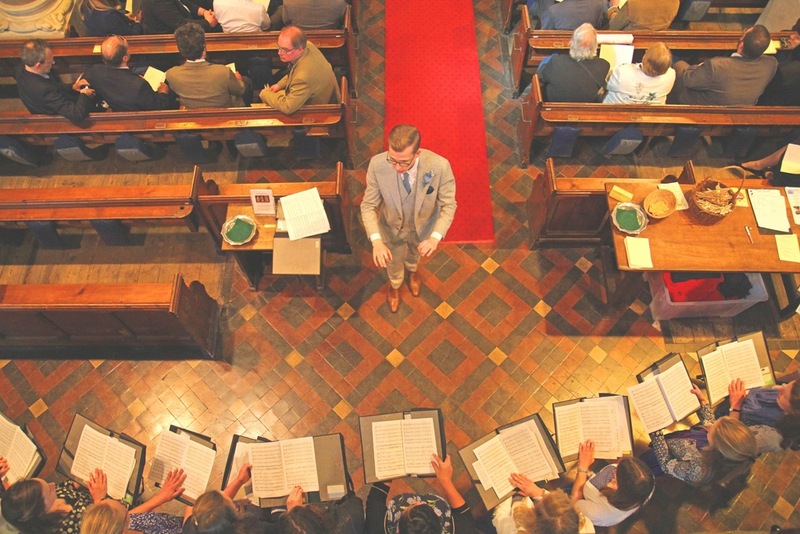 Our album starts with the song I walked down the aisle to ; the song we walked out to ; all the music we sang in church (we also made an audio recording of the entire service, readings and all); and then all the songs that remind us of each other, and that now remind us of our wedding day, too." Jess will be back in part 2 next week, all about making stuff!